Yesterday, I put up a post about not being so happy with my body and being a little hard on myself. Then I went to a class at my gym and felt so much better. It's not just a class, it's a community. 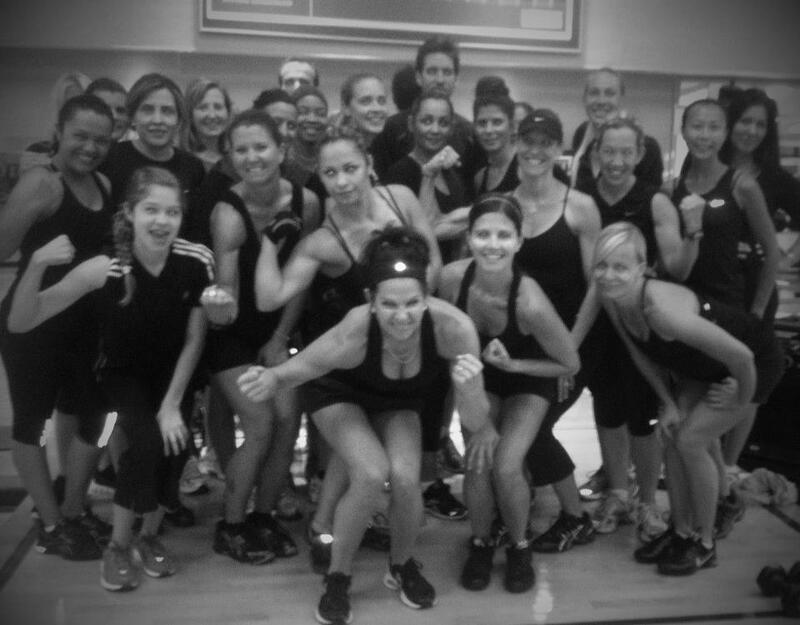 A community of women (and a few men) that come together once a week to push themselves to the brink. Push-ups, jump lunges, burpees and more. I love this class. I look forward to this class. I feel strong and beautiful. Look at this fierce group of strong women and a couple men. Love it. It's also a place to catch up with friends, most of them I met at this class. Some days it is the only time I see other grown ups. Some days the end of class where our instructor says "just lay still and relax and let your mind go," it is the only time I do that all week. It's just all kinds of good stuff and everyone needs a class or community like this, that I know for sure. Bullying is serious. A local filmmaker is trying to make a movie, called The Bully Chronicles, that I believe will truly make a difference. Watch the trailer and then click here to see how you can help get this movie made. Who needs toys, when you have potatoes? At least if you're my toddler Wade. 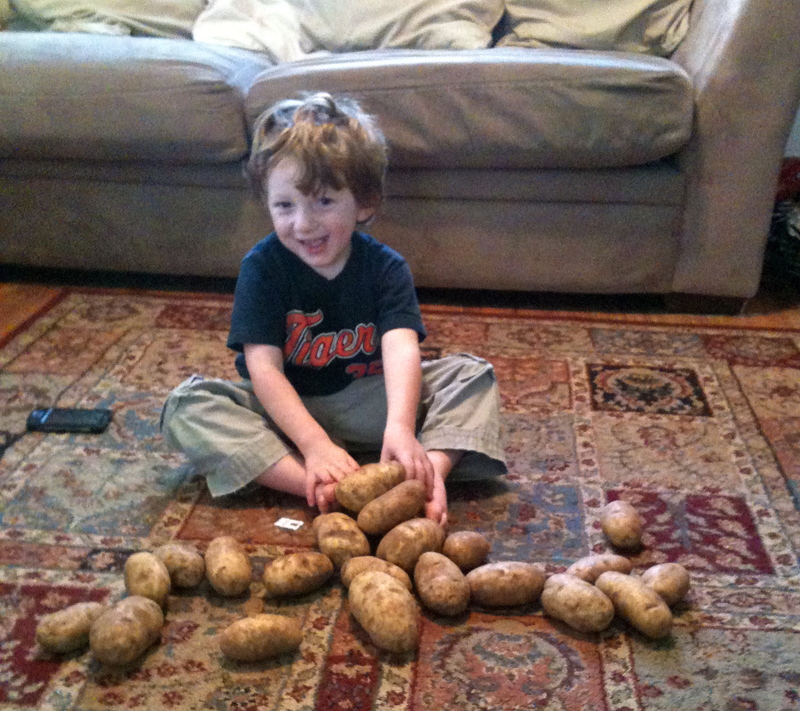 I found him playing in the living room, having a grand old time, with potatoes. Guess what he's getting for Christmas! This YouTube channel, Kin Community, makes soup look cool. I've said it a couple times, that I hate soup. But yet, here I go again posting about soup. Maybe I don't hate it after all. Jimmy Fallon + Justin Timberlake + History of Rap= Never Gets Old. Enjoy, again. Women friends, especially mom friends, are critically important. Over the past two weeks I've had lunch dates with a couple members of the Mom of Four Club (the club consists of women crazy enough to have four children). It is so nice to talk to other women that know what it's like to be so vastly outnumbered in your own home. I felt so much happier and relaxed after spending time with them. Online friends are just as important. Honestly, I've gotten to know so many people via this blog, instagram, Twitter and Facebook. For that, I am so grateful. Come on over and be my friend on Facebook page, or follow me @AngelaYblood on Twitter. Check out my non-craftiness as I try to Pinterest my pumpkins in the latest MomPulse video.